After missing my sub-20:00 5K goal by a fair bit on New Year's Day, I decided to make another attempt at breaking the barrier. Based on my spring race schedule, this weekend was the best option. Races in February are slim pickings, and not really PR courses, so I found one in Fredricksburg (about an hour south) that seemed like it would be a good candidate for sub-20. The elevation profile on MapMyRun made the course appear like it was gently rolling the whole time with no major climbs. Even though the race would be small, the course was USATF certified. On Wednesday morning, I woke up feeling abnormally tired and not like my peppy self. I observed that my resting heart rate (which I track with my FitBit) had been on the upswing for the past few days and was now at an all-time high of 50 bpm. Typically it's around 45. With the flu going around, I made sure to be extra careful about coming into contact with germs, started drinking more water, and taking more vitamins. Thursday morning was the same story, but I ran in the evening by which time I was feeling more energized. On Friday, I woke up with an upset stomach and my 30-minute easy run felt really sluggish and heavy. Greg was also waking up with a dry throat and not feeling his best. I told myself that everything was fine, and I didn't speculate any impact on my race. We arrived at the race site about an hour before the start. Greg was running the 10K, which started at 9:45, and I was running the 5K, which started at 10:00. We picked up our bibs and scoped out the course. Most notably, we could not find a start line. We found the finish line, but we knew that the race did not start and finish in exactly the same spot. This made the course net uphill, but not by a lot. We knew that the race director would be providing instructions immediately before the race, so Greg and I warmed up and made it back to the start area shortly before 9:45. There were about 50 runners doing the 10K and 100 runners in the 5K. My weather app had said "rain starting at 10:30" so I expected that the rain would hold off until we were done. I debated wearing my hat anyway, but there wasn't even a drop in the sky so I left it in the car. There was no actual start line. The race director told everyone where to stand and then he ran about 30 feet ahead and started counting down from 30 seconds. He had his phone in his hand, seemingly to communicate with the person starting the clock. At the end of his countdown, he yelled "go!" so that both the timer and the runners could hear him, hopped on his bike and led the pack of runners up a steep hill, out of the park and onto a paved path. The race was chip timed, but based on gun time as opposed to net time. However, with only 50 runners in the 10K and 100 runners in the 5K, everyone started within five seconds of the race director yelling "go." This was definitely not the traditional start that I was used to, but the course was certified, my Garmin ended up reading 3.13, and my gun time was accurate, so it all worked out. I watched Greg immediately take the lead and I cheered for him as he passed by. I spent the next ten minutes continuing to warm up while waiting for the 5K to start. The race director returned to the park on his bike and then briefed the 5K runners about what to expect. I was glad I had watched the 10K first so I knew exactly how it would go. As he was giving his briefing, it started to rain. It was too late to grab my hat, and I hoped it would just be a light drizzle and not soak the course. But, as if on cue, as soon as the race director yelled "go," the rain began to fall in full force and I quickly became drenched. 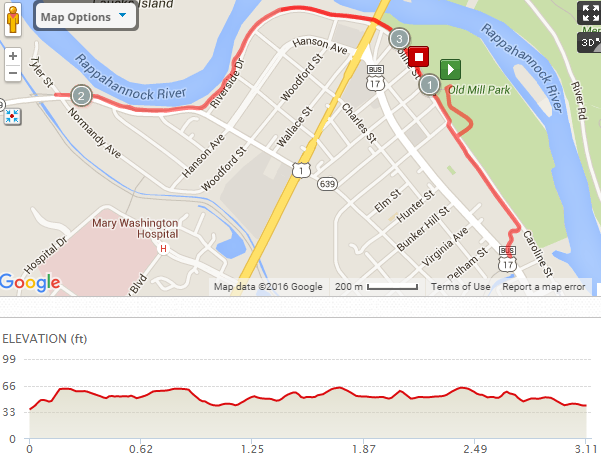 Note to self: courses with steep hills in the first half mile are not conducive to sub-20. I learned this on New Year's Day, only this hill was steeper--almost to the point of needing to walk. Once we got out of the park onto the bike path, I was relieved. But within just two minutes, there was another big hill which curved up and around. Totally unexpected. I did warm up on the course, but I had gone in the other direction on the trail. At the top of the hill we turned around and headed back toward the park. Now that these two hills were done with, I figured the rest of the course would be a lot easier. I think I took these initial two hills too quickly and then paid for it later. Because I thought the course would be relatively flat, I assumed I would be able to recover from my hard pushes. But I never really recovered. It was also pouring. There was no mile marker, but my watched beeped 6:41 and I didn't judge it. From this point on, the course, which was a paved bike path was up and down and up and down. I'm used to road races where you might have a quarter mile stretch of up hill and then a long stretch of downhill. But in this case it was constantly undulating, with some longer stretches of up and down. There was not a single flat section. I'm not sure why I thought this would be a good sub-20 course. Clearly, it was not. The rain compounded issues and I started running out of gas. I felt like I had nothing to give. I wanted to push hard, but I didn't have it in me to go any faster. I did, however, pass one of the three men that was ahead of me, which was a good feeling. No women were ahead of me, which seemed to be the only positive thing. There were a few bridges to run over which were slippery due to the rain. I slowed down a bit because I was paranoid about falling. There was no mile marker 2, but my Garmin beeped and showed a disappointing 6:44. A few weeks ago I had run a 3-mile tempo run at a pace of 6:44 and it felt awesome. Now, I felt totally gassed. 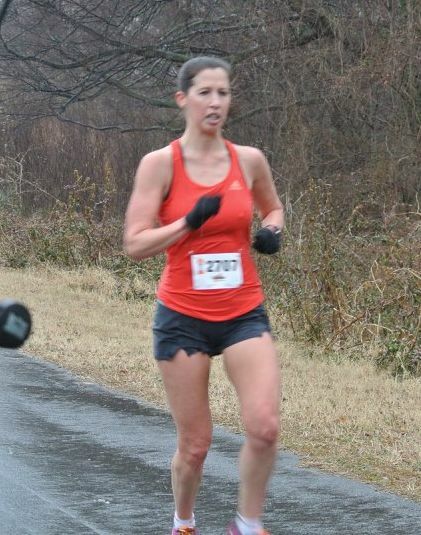 The finish line: flattering photo, right? At this point, the only thing that was motivating me was that I was in the lead. The second place woman seemed to be about 30 seconds behind me at the turnaround, and if she had a good kick it was possible she could catch me. I repeated to myself, keep winning the race, keep winning the race. I was mentally and physically defeated at this point and all I wanted was to keep my first place position through the finish. And I did! I won the race in 21:08. I was the 3rd overall finisher, with just two men ahead of me. I crossed the finish line and the race director handed me a plaque and a wine glass for winning. Normally they would do an awards ceremony type of thing, but it was pouring rain. I thanked him and then waited for Greg to finish the 10K. I knew I'd only have to wait about five minutes. I saw a fast-looking man cross the line, and glanced down to see that he was wearing a 10K bib, and then Greg crossed just seconds behind him. Apparently Greg had been neck-and-neck with this guy the entire time, and he out-kicked Greg at the very end for the win. Greg ran a PR in 40:51. His 10K pace was faster than my 5K pace! We were drenched and tired and decided to drive straight home instead of eating lunch in Fredericksbug as originally planned. I was happy that I won the race, but not pleased with my performance. 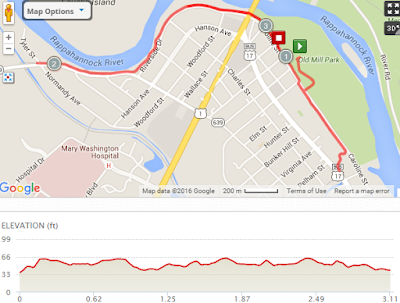 With 131 feet of gain over just 3.1 miles, that course wasn't conducive to sub-20. I also think I am fighting off some kind of bug. If I had to do it over again, I would have been more conservative on those first two hills. The downpour was another unwelcome factor. I'm not sure I would have chosen this course if I had accurately interpreted the MapMyRun elevation profile; which looked a lot less intimidating than the actual Garmin data. There's a local 5K tomorrow on a course that I've run many times before that I probably would have chosen. That course is also quite challenging, but I'm familiar with it and probably could have set a course PR. On the other hand, I did end up with an overall win, which is rare for me. Looking at the bigger picture, I am a bit discouraged about this whole sub-20 thing. I think it's going to only get harder for me as I get older (I turn 40 in November) and usually you don't hear about women who have been running for 15+ years finally breaking 20 once they turn 40. But we'll see. I'll try and train for it again this summer and hope that I can find a good course with good weather conditions. My half marathon pace four weeks ago was 7:00, and this race averaged a pace of 6:45, which seems totally off. In fact, several of my miles in the half marathon were in the 6:40's. I've heard many runners say you can't be in shape for a 5K and also for the longer distances at the same time, but I haven't really started the bulk of my marathon training yet. So I'm not sure exactly what I am in shape for, if anything. Or maybe I am, but I'm truly fighting off some kind of illness. In any event, I won. So I'll just be happy with that and focus on my next race, which is the Rock 'n' Roll New Orleans half marathon in three weeks. This made it worth the trip! Even though the race had no mile markers or actual start line, it was well organized for a small, local race. The course was certified, there were aid stations, it was clear when to turn around, they took photos, and I liked the plaque that I won. If you're local, check out Bishop's Events. 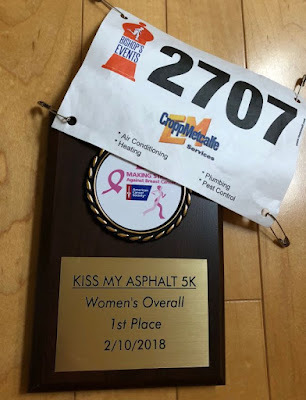 I primarily run marathons, but I have had similar frustrations with racing shorter distances and found that the key for me was a really good warmup, at a good solid pace, shortly before the race. Congratulations on your win and a great finish time, especially when you were feeling under the weather (literally). I think you should roll with it because you had a lot going against you in this race. Not feeling well, the drive, the rain/weather, the janky course, and no competition. I have won a few small races like this one, and while it is nice to win... I almost never set a PR at a race I have won by a decent margin because once I know I've got it for the ladies, it's like my body slows down to conserve something for the next run. I really think our best times come when we have a deep field of runners. I hope you do not have the flu or anything bad and that you feel better soon! And hooray for low resting heart rates- even out of shape mine is still 47, haha. I was shocked, but guess that's just a runner problem. Well done on the solid race. If you are ill that's even more amazing! You'll have that sub 20 min 5k soon I'm sure. Well Zebra I will offer you my often different perspective to help you see your race performance in a different light. I feel you put too much focus on this "sub-20" 5k goal. And even if you ever do break that 20-min barrier...what next...a sub-19? We are all mortal runners and at some point you will have to face their are limitations to your abilities, and not all runners are created equal, nor do they excel at all race distances. And my knowledge of coaching and training principles would concur with that distinction if you focus your training to run longer distance races as half and full marathons, you cannot at same time train to run your ultimate potential in the 5k. Personally, I think your forte is speed and strength to run fast in the longer distances. To run sub-20 in 5k could require you a total shift in training and racing...focusing only on training and racing 5k's...not 5k's interspersed in a longer macro-cycle of training to run half and full marathons. The 2nd point is you were the 1st place woman overall! Even world elite distance runners don't care about the PR...just that they win or where the end up placing relative to the rest of field/competition. Years ago when I ran Grandma's Marathon in Duluth...the front or elite field had several men and I think some women Kenyan runners. I don't recall the exact times, but if they finished and won the race in 2:16 or so...they took with them a nice cash prize and 1st, 2nd or 3rd place medals. It wasn't about running their fastest PR, or even breaking the course record (though the latter has some incentive in extra prize money). They just ran the race to finish or place 1-2-3. You ran that 5k recognizing you were lead woman, and you ran what it took to finish 1st woman overall. The FT doesn't matter in that sense...you ran what it took to be place first! I never was good, nor did I even like running the 5k or lessor race distances as it was all about running in the "uncomfortable zone" of extended duration at 90-100% HRmax. It was what I called the "puke your guts out,,, after you cross the Finish Line" racing. And even when I ran my fastest 5k at average 6:48 pace in my mid-50's...I knew it was unrealistic to expect to come in first overall male as way too many younger men ran far faster than sub-20. And just short of 3-mi mark I came to a brief 1-3 sec walk to recover at crest of hill. I knew I was still going to finish 1st in my age. At that time it was (still is) my PR, and then my only disappointment was that that last hill the HR intensity so painful that at the crest..that I couldn't run through it without those couple secs of walking. There are always ways to find disappointment...and always ways to discover the positive of your training and your race efforts. You ran a 5k to the best of your ability on that day and those specific conditions and you 1st female overall. Celebrate and cherish...irrespective of the FT. There could be another book in the making..."Sub-20"....LOL! Enjoy your moment...enjoy your win. You don't have to give up chasing that "Sub-20 Antelope"...just don't be disappointed if you don't catch it. Besides...it's all about "chasing the antelope" and not capturing it. Winning is ALWAYS a good day - and I think that winning or leading (even for part of the race) can be harder than PRing. In fact, it is tough to PR when you are in the lead! Definitely more effort, and the race can become tactical instead of a time trial. Good work in bad weather for an overall! Oh, and sub-20 will come - soon, and easily!